Risk management is your own responsibility. You’ve been told what conditions to expect; you know what equipment you have at your disposal; you know how much breathing gas you have to complete the dive; and you know how you will get back out of the water. What are the risks that you must consider? Pressure-related problems are the most insidious because they are not visually apparent. Going deeper than you planned could mean mandatory decompression stops, which means it will take you longer to get to the surface than you anticipated. Also, your air supplies may not last as long as you expected if you go deeper than you intended. It is important to remember that your air at 30 m (100 feet) deep lasts only half as long as it does at 10 m (30 feet). It’s your responsibility to take control. If you feel that the planned dive is beyond your capabilities, you should say so. You must never let peer pressure influence you so that you are dragged unwillingly along by the enthusiasm of the group. Bravado is misplaced on a dive deck. You must adjust the plan to suit your experience and get prior agreement from your buddy. You cannot discuss these matters deep underwater. It is vital to set limits you are happy with and stick to them. What are your limits? The dive may be deeper than you are comfortable with. You may decide that, considering the size of your tank and your air consumption, you’d like to try a dive that is less ambitious. Perhaps the current is too strong for you, or you would prefer to drift with it while your buddy plans to swim against it. You may be unhappy about a plan to penetrate a wreck and would prefer to look at it from the outside only. You need to consider whether you are happy with the pick-up arrangements and those for getting back on the boat. You must decide whether the surface of the sea is too rough for your liking. If you let others influence you at the planning stage, you may find that when you are underwater, things start to go wrong. Your heart rate increases, you find you are working too hard and you start to breathe quicker and quicker. There is nothing more likely to increase your air consumption than the realisation that you are running low on air. Hyperventilation leads to panic. If this happens to you, the first thing you must do is calm down. You should think carefully and act accordingly. Don’t do anything in a rush – panic can have dire consequences. If your pressure gauge is in the red section, but you need to make a safety stop at 5 m (15 feet) deep, you must stay calm and breathe normally. You’ll be surprised how long the remaining air in your tank will last in the shallows. Once you are at the surface, keep your mask in place and inflate your BC orally if necessary. Next time, you’ll be sure to never put yourself in this predicament. 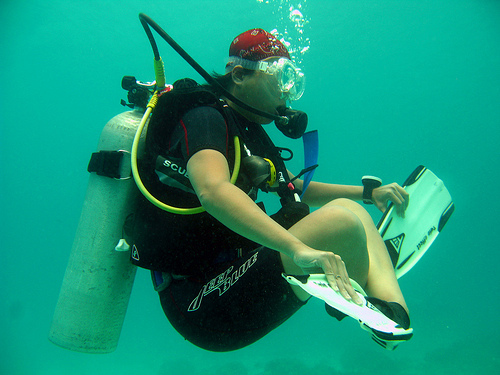 Most divers have some bad experiences, but it is important to learn from them.